BUY WITH CONFIDENCE FROM PODIUM RACING. You’re looking at a new 57 piece set of TITANIUM bolts in SILVER/NATURAL that will replace ALL of the standard steel bolts on the external engine covers, including clutch, valve inspection covers, flywheel, etc. This kit will fit ALL Ducati 2 valve air cooled models including Monster 600, 620, 750 & 900’s, as well as 900 Superports and Superlight’s . This kit is also available in blue. The standard nickel plated steel bolts quickly corrode and detract from the fabulous look of the Ducati bikes. Replace all of these nasty looking bolts with corrosion resistant titanium and save weight in the proccess! 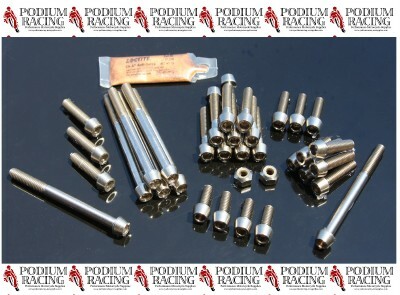 This kit includes all that you will need and they are easy to fit, just remove one bolt at a time and match to the same size titanium bolt in the kit and replace. PAYMENT OPTIONS: Podium Racing can only accept Paypal according to Ebays policy. Checkout can be completed without a paypal account using any major credit card just follow the “Pay Now” links. PAYMENT METHODS: For Paypal payments use Ebays check out procedure. All payments are due within 48 hours of auction ending. Please do not bid if you don’t intend to buy. SALES TAX: No sales tax! WE DO COMBINE SHIPPING AND WE DON’T CHARGE HANDLING JUST PACKAGE WEIGHT! IF EBAY DOES NOT DISCOUNT SHIPPING ON MULTIPLE PURCHASES THEN PLEASE CONTACT US AND WE WILL APPLY THE CORRECT DISCOUNTED SHIPPING RATES. Podium Racing ships via USPS. Most small items are shipped by First Class Mail which usually takes 3-5 business days domestically and 6-8 days for International shipments. Podium Racing can also ship Express or Overnight at an additional cost. Insurance is also available at an additional cost. E-mail notifications are sent out when the package has been shipped and a tracking number will be provided when available. Most items are shipped within 24 hrs of receiving payment. If there will be a delay in shipment we will notify you via e-mail. The team at Podium Racing want all of our customers to be happy with their purchase and hopefully keep coming back. If you are unhappy please let us know and we will do all we can to correct the situation. If you are unhappy for any reason you can return the item to us within 7 days for your money back minus the shipping charges. If you are unhappy with the quality or there is a problem due to manufacturing defects you can return the item to us within 7 days for full refund. Welcome to Podium Racing’s ebay store and thanks for checking us out! Our store is run by long time riders and racers who all share a passion for riding, usually very fast. As a small store staffed with riders we love answering questions and we will respond to every email. Unlike the big stores we love our jobs, the bikes we ride and the products we sell. Mostly we focus on Ducati’s as these are the bikes we own and race. At the moment we have a 2001 996R a 1978 series Mike Hailwood Replica, 2004 999 and of course a 1098. In the racing stable we have a 2001 996RS. We started this business to provide high quality competitively priced products for the bikes that we love to ride. Everything we sell has been tried and tested on our bikes and we won’t sell items that we would not use ourselves. 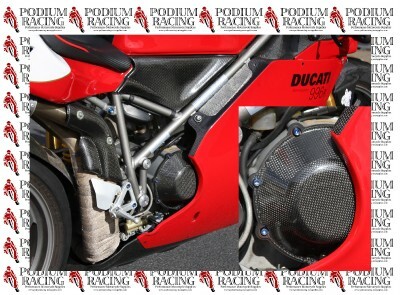 Our goal is to make your bike go faster and look better while helping to keep the cost low and help keep a classic Ducati racer on the track! Please contact us through our eBay store or you can find us on the web.